BelarusDigest > All > Will anti-western rethoric help Belarus at the United Nations? At the UN General Assembly session in New York in late September, foreign minister Vladimir Makei and his deputy Valentin Rybakov worked to promote Belarus’s geopolitical philosophy alongside a few more concrete priorities. The priorities included broader access to UN development assistance, protection of traditional family values, nuclear disarmament and development of trade relations. While seeking to improve Belarus's bilateral relations with the democratic world, Belarusian diplomats continue to use anti-Western rhetoric profusely in their public statements at the United Nations. Vladimir Makei spent five very busy days in New York. His working schedule on 19-23 September stood in stark contrast to his predecessors’ similar trips to General Assembly sessions. The minister's speech at the general debate, traditionally the central element of such visits, has rarely been complimented by anything more than a few ritual meetings with foreign counterparts. This time, however, Vladimir Makei delegated the privilege of delivering the main speech to his deputy, Valentin Rybakov. Meanwhile, on 19 September, Belarus’s chief diplomat gave a statement at a high-level meeting of the General Assembly​ on refugees and migrants. The statement primarily blamed those countries “behind the fuelling of conflicts on the territory of sovereign states" for the refugee crisis. Makei’s list of culprits might include Belarus’s closest ally, Russia. In an interview on UN Radio later that week, the minister spoke at length about his country’s achievements in accommodating refugees from Ukraine, where Moscow has been fomenting separatist movements. On 21 September, the foreign minister handed Belarus's letter of acceptance of the Paris Climate Agreement to Ban Ki-moon, the UN Secretary General. Belarus emphasised the fact that it is among the first thirty countries (only five of them European), to have ratified the agreement. On the same day, the Belarusian minister spoke at a ministerial meeting in support of the Comprehensive Nuclear-Test-Ban Treaty. On 23 September, Makei and his Costa-Rican counterpart co-chaired the first ministerial meeting of a group of like-minded middle-income countries. The group, which seeks to promote the interests of about 130 middle-development nations, now consists of thirteen countries, mostly from Latin America, but also includes Armenia and the Philippines. In the early years of its independence, Belarus received UN development assistance as a part of a group of countries with economies in transition. Now, Minsk is seeking access to such resources by promoting the adoption of a UN system-wide and long-term strategy for development cooperation with middle-income nations. However, this group remains too large and diverse to become a target of a meaningful uniform strategy. On 23 September, Makei also spoke at a high-level meeting on the implementation of water related Sustainable Development Goals. The main purpose of his statement seems to have been to do a favour to Tajikistan by supporting its president’s initiative to proclaim an international decade of “Water for Sustainable Development”. On 22 September, the Belarusian minister took part in several multilateral events held on the sidelines of the General Assembly​ session. Two of them were informal meetings of member states of the Collective Security Treaty Organisation and the Central European Initiative; Belarus will incidentally be chairing both organisations in 2017. At the high-level OSCE event on civilian crisis management, Makei underscored Belarus’s willingness to fully support the organisation’s efforts at crisis management in Ukraine. Unlike in 2015, this year the foreign minister's bilateral meetings in New York included a geographically diverse group of countries – he met with his counterparts from Azerbaijan, Angola, Croatia, Ecuador, Eritrea, Germany, Latvia, Mozambique, Oman, South Korea, Syria, and Turkey. Importantly, Makei was quick to take advantage of his visit to discuss the development of Belarus – US relations with American officials after the recent elections in Belarus. The minister met with Victoria Nuland, the US assistant secretary of state, and Michael Carpenter, the US deputy assistant secretary of defence. Belarus and the United States are now focusing their dialogue on regional security issues, mostly in the context of the conflict in Ukraine. However, one can hardly expect a breakthrough in political or economic relations between the two countries in the near future. 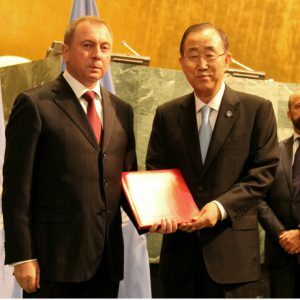 In New York, Makei signed an agreement with the US on the protection and preservation of certain cultural properties. The document became the first intergovernmental agreement concluded between Belarus and the US in the last two decades. Despite the agreement’s generic title, the document, signed at the World Jewish Congress headquarters, focuses mostly on the protection of Jewish heritage in Belarus. Makei admitted at the signing ceremony that “the agreement [would] allow American donors to contribute to preserving historic and cultural heritage in Belarus that bears significance, first of all, for the American Jewish community”. In his interview on UN Radio, Vladimir Makei criticised his colleagues for bringing up domestic problems in their statements, emphasising that one should only talk about “conceptual matters” at the UN. Deputy foreign minister Valentin Rybakov obeyed his boss’s instructions. His speech at the general debate on 26 September was a conceptual statement based on a strong anti-Western and anti-capitalist philosophy. Rybakov blamed the world's current woes on the chaos, in his opinion, “resulting from the interplay of three factors – political, economic and social”. First, the victors in the Cold War (i.e. the West) failed in their attempt “to impose their will on their opponents”. Second, the balance between the state and the market was destroyed as “the market gained precedence”. And third, the West has been forcing other nations to embrace changes in public opinion with regard to such “key life categories as morality, ethical values, and family”. Belarus promotes its idea of a “new world order”, which should be “state-driven, inclusive and cultivated”. Advocating the idea of “a strong state, above all, in the economy”, Rybakov referred to “the will of the people of Belarus unequivocally expressed at the Fifth All-Belarus People’s Congress last summer”. Anyone at least vaguely familiar with Belarusian politics knows that the authorities have always hand-picked the "delegates" of such congresses to rubber-stamp the regime’s plans. Most challenges that Belarus now faces stem from the regime’s outdated economic policy, its ill-judged and unreserved affiliation with Russia, and long-time neglect of issues of national identity. However, Belarusian diplomats prefer to play global politics and use the UN rostrum to pin blame for their country's economic, social and security failures on West-induced "global chaos". This may please Russia and help to secure sympathies of some third-world nations but is unlikely to strengthen Belarus's positions at the UN. On 14 September 2016 First Deputy Prime Minister of Belarus Vladimir Semashka announced that negotiations on oil and gas relations between the Belarusian authorities and Russia's main economic players had failed. Meanwhile, the oil crisis has cast further uncertainty on how long Belarus' economic recession will continue and whether the execution of the state budget for 2017 will be successful. The only way left for the government to rectify the economic situation is to hope for help from the IMF, which started its mission on 19 September 2016. The Belarusian authorities had planned to resolve their problems with Russia in the energy sector on 13-14 September 2016, but negotiations between the governments failed to yield results. 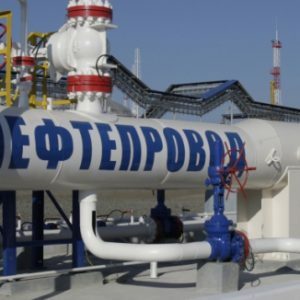 According to the 2011 Belarusian-Russian intergovernmental agreement, the gas contract price for Belarus is pegged to the tariff payable by Russian consumers with the addition of transportation and storage costs, equivalent to $132 for 1,000 cubic meters. The Belarusian authorities consider a fair charge for Russian gas to be $73, calculated as the cost of gas on the German market minus transportation costs and export duty of 30 per cent. However, the Russians are insisting that the already signed energy contract is valid for the 2015-2016 period, which includes a predetermined price formula. Thus, there is no possibility that the contract price can be changed. The establishing of equal gas prices will only be possible by the end of 2025 after creating a common gas market within the Eurasian Economic Union. Meanwhile, the total amount of Belarusian debt for gas supplies has already reached $300m. As a result, on 16 September 2016 Russian Deputy Prime Minister Arkady Dvorkovich announced that the supply of crude oil to Belarus would be reduced by 5m tonnes (or 25 per cent of total supplies) in the second half of the year (see Figure 1). However, the intergovernmental agreement between Belarus and Russia in the energy sector signed on 29 May 2014 clearly states that Russia has no right to restrict the supply of oil. The document specifies that for each calendar year the parties will jointly develop and approve the volume of oil and petroleum products supplied. There is provision to vary supply volumes, but not by more than 2 per cent. Therefore, the total variation in oil supply may not exceed about 480 tonnes for the whole year, far from the 5m tonnes threatened by Russia. Initially, the Belarusian authorities forecasted 0.3 per cent economic growth in 2016, but later amended their predictions to a decline in GDP of 2 per cent. However, this year the refining of oil is set to be one of the core brakes on the economy. If the supply of the so-called "black gold" does not double, economic growth in the next year would seem miraculous. The official forecast for 2017 assumes that Belarus will obtain 24m tonnes of oil. As a result, the recession would end and GDP growth would amount to not less than 0.2 per cent (assuming the average world oil price of $35 per barrel) or 1.5 per cent (assuming an oil price of $45). However, the official economic plans for the next year do not account for a decline in the volume of Russian oil supplies to the country. On 23 September 2016 Prime Minister of Belarus Andrei Kobyakov announced that the total losses from oil shortages to Belarus's economy had already accounted for 0.3 per cent of GDP. The latest Belstat data shows that the GDP of Belarus in January-August decreased by 3 per cent on the previous year and had outperformed the January-June GDP data by 0.5 per cent (see Figure 2). There are other core factors which affect the government's macroeconomic predictions. One of these is investment activity. This year it has been highly unstable. Even agriculture is slowing down. Due to decreasing prices on the Russian market Belarus is unable to benefit from increasing volumes of trade (see Figure 2). However, another important factor in the oil drought is a decreasing level of income within the Belarusian budget. In 2016 the government planned to use more than $1.1bn in revenues from export duties on petroleum products and oil to repay foreign debts. In the first half of the year because of lower oil prices and supply cuts from Russia, Belarus received only about $390m or just one-third of the money it had anticipated. Meanwhile, the core project of the 2017 budget will involve making payments on external debt and arranging its refinancing. In particular, fees from the sale of petroleum products will go directly towards the repayment of foreign debts. The price of oil has fallen and the country does not have enough money to settle with its main creditors, namely Russia and the Eurasian Fund for Stabilisation and Development (EFSR). Even if the price of oil does exceed $35 and Belarus receives a new tranche of the $700m loan from the EFSR, it will not help to repay the external debt of $3.2bn in 2017. The budget is still short of $1bn. Therefore, taking into account all the possible social and economic risks, Belarus urgently needs new credit from the IMF. Belarus has been trying to test the waters during negotiations with the international organisation between 19-30 September 2016. Moreover, the decision from the IMF is being eagerly awaited by the end of the year by the authorities, who hope to receive several tranches as early as 2017. In conclusion, the longer the Belarusian authorities wait for the introduction of painful structural reforms, the worse the economic situation in the country will become. The time will come when neither financial aid from the West, nor dwindling oil streams from the East will be sufficient to help to revive the crumbling economy.